The weather was already pretty inconsistant with periods of rain and periods of grey, gloom. So we decided to make it a museum day. The Magritte Museum was quite high on our list, unfortunately for Bobby & Erica it was timed entry and the next available slot was after they needed to head back to Germany. 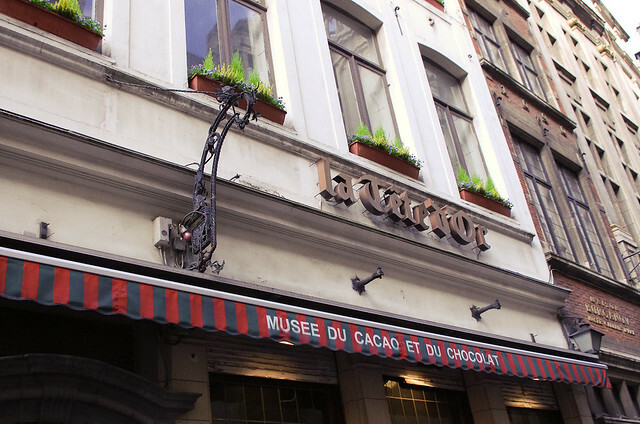 So Stephen and I got those tickets in advance (our train being later), and the group's second choice was the Chocolate Museum, or more formally the Museum of Cocoa & Chocolate, located around the corner from the main plaza. It's quite a small, narrow space, filled with various tidbits & trinkets of the chocolate trade, both historical and more modern. While overall quite a fun space, many of the particular exhibits are somewhat dated; still there's plenty to wander around and poke your nose into. An example of a traditional canoe from Africa used to transport cocoa beans. 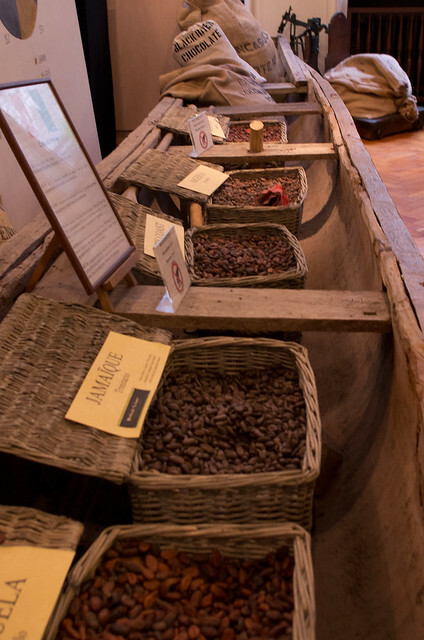 Inside are baskets of beans from different countries to showcase some of the differences even at the raw stage of the chocolate production process. One level up from there was a room filled with various chocolate crafts including this display of chocolate clothing. 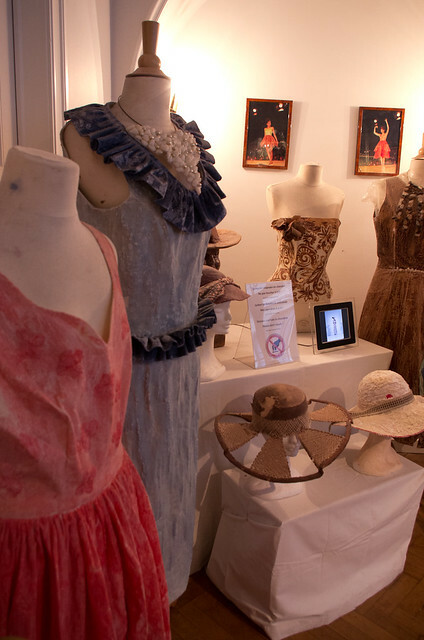 Yes, clothing made from chocolate. Kind of cool, though for obvious reasons quite brittle. On the wall heading back downstairs was a series of stock certificates in many old chocolate companies. This one in Imperial Russian caught my eye. 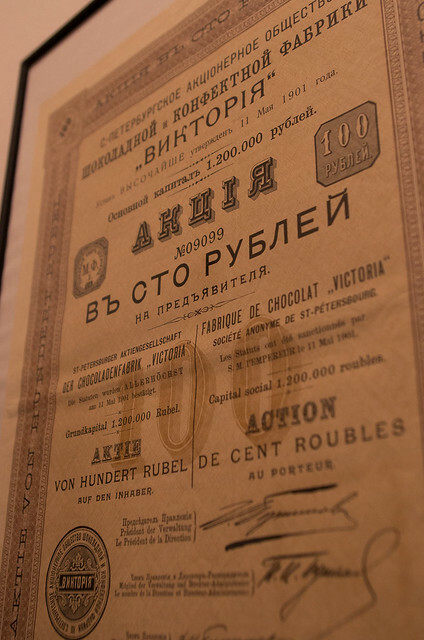 Even then, the chocolate trade was global - the stuff of empires. The highlight of our visit however, wasn't the exhibits, but rather the demonstration! 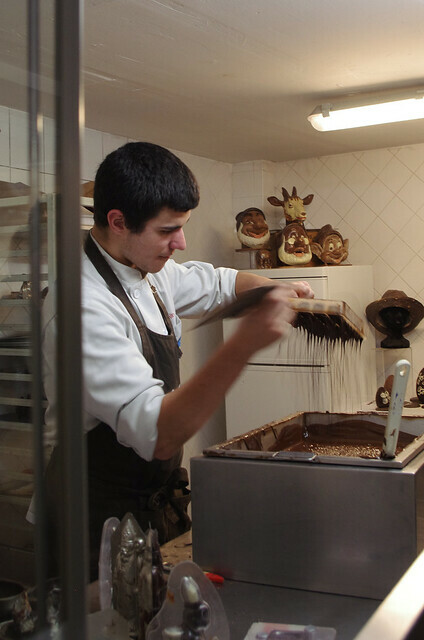 Held in a kitchen at the back of the musuem, we were taken through how modern day chocolatiers practice their craft. 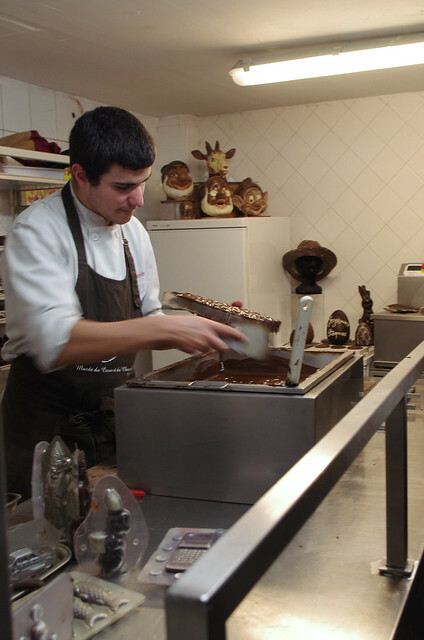 On show for us, was the way that pralines are made. 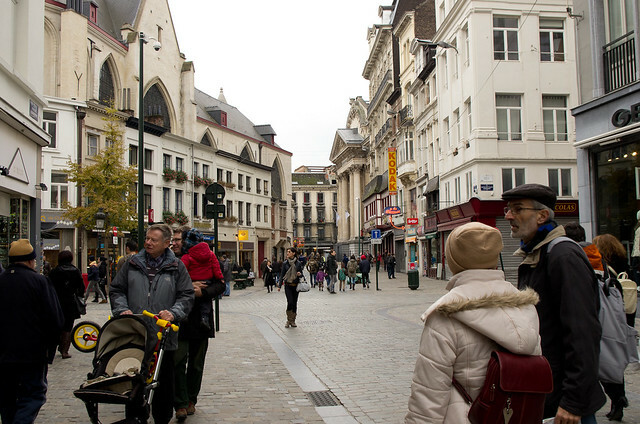 Pralines were invented in Brussels, so it was a very fitting choice. 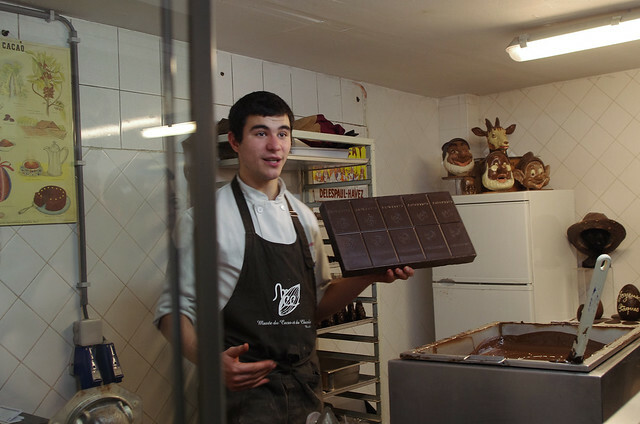 Unfortunately, I didn't catch the name of the truly charming young chocolate maker who gave the demonstration. Not only was he clearly skilled in his craft, but he also gave the talk in 4 languages! I was tucked back into the corner, so apologies for the rather awkward angle of the photographs (not to mention the bar of the glass cabinet to my left). Showing us how most chocolatiers receive their chocolates - in large bars of about a kilo each, which then have to be melted in vats (such as the one on the bottom right of my photo) before being worked. I didn't realise how simple the process for making pralines was! Basically, you take a mold - that can be anything from something that resembles an ice cube tray to children's masks (see in the background below)- fill it with chocolate. . .
Evening out any rough edges. A thin coating of chocolate sticks to the sides while the rest falls back into the vat, resulting in thin shells that can be filled pretty much with whatever you like. Fun! And he encouraged us to try them at home and let our imaginations run wild. Erica and I exchanged rather meaningful glances. I haven't had a chance to give it a go at home yet, and wonder if she has. Still it was quite a lot of fun and he had such a gentle and kind demeanour that we stayed chatting with him for quite a while after. Definitely the highlight of our trip. 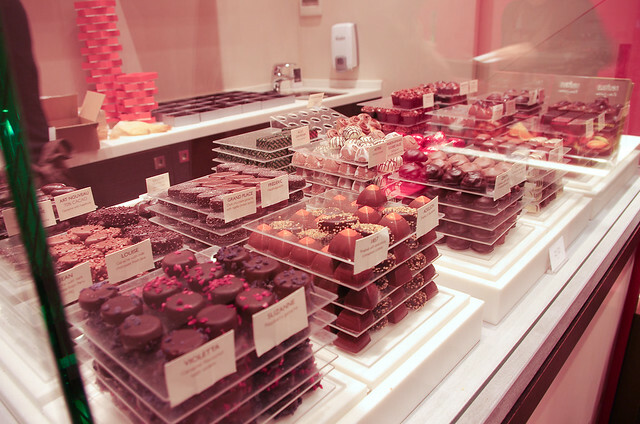 And after all that, we couldn't really help, but go around the corner to Leonidas and pick up some yummy pralines for ourselves! A truly mouth watering selection, no? A quick bite to eat in a local pub, by which time, the sun had started setting on us again, and it was time to say good-bye to Bobby & Erica (it always seems to end too soon!) while Stephen and I headed off to finish our day at the Magritte Museum. Approaching the Museum from the South. Our tickets included an audio guide, which Stephen got in French and I took in English (sadly, my French isn't quite that good). We were both really impressed not just with the guides but with the over all curation of the permenant collection itself. It manages not just to cover Magritte's development as an artist, but to place that development within the overall historical context of the region. So the collection includes not just paintings and sketches, but family snapshots, letters, journals and other publications of the period. Very thoughtful and we walked away with a much richer understanding of this incredible artist but also a larger appreciation for his particular moment in art history. We literally stayed until they kicked us out, going back and forth between different works that we liked or didn't like and exploring some of the themes (body image, peace, social conciousness) in more detail. 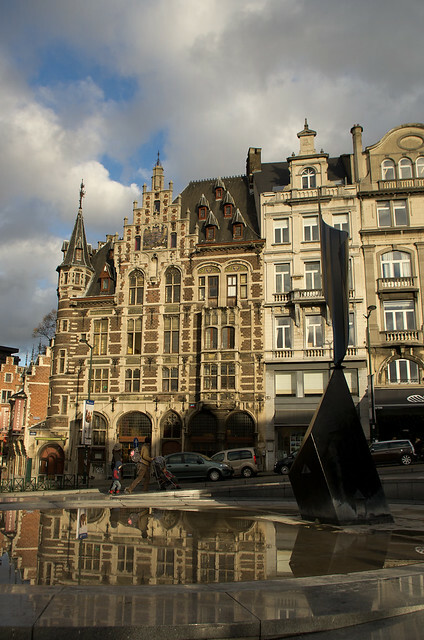 We took a leisurely route back to the hotel, still thinking about Magritte and enjoying the late evening sunshine as it reflected off the buildings. 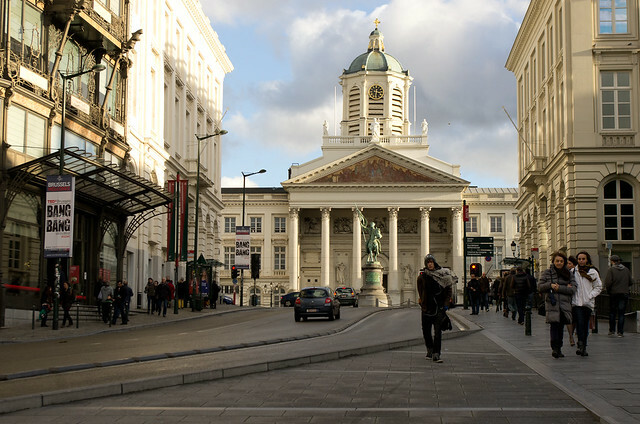 Overall, I must say I was much more charmed by Brussels than I expected to be. I expected a slightly dingy, industrial city that lacked soul. What I found was a relatively quite capital that had really interesting architectural features and history to match. A delightful weekend full of unexpected surprises - just what we needed! A selection of my photos appear above, but if you want to see all of them, head over to my flickr page.